Photo: Hold your horses and your awe-struck gaze... this is a big one! Mayon Volcano, named after the mythical Filipino Princess Daragang Magayon, located in Legazpi City is a successful attention seeker. The volcano springs to life every few years whilst maintaining its perfect symmetric conical shape. The Earth is an amazing planet. 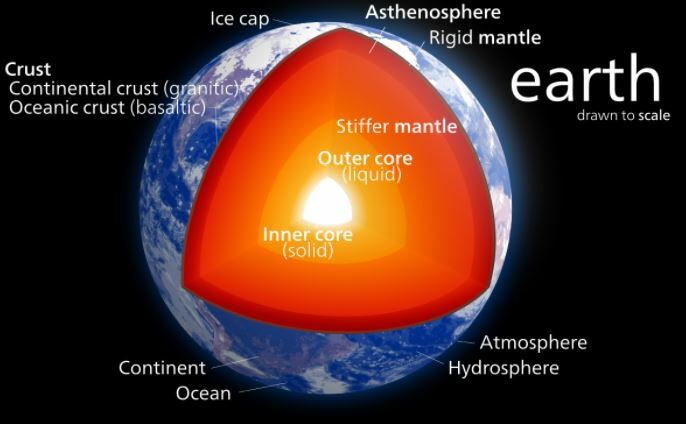 It has a volatile molten mass, extending from under the earth's thin crust to its iron-nickel alloy core. This liquid fire, which is the engine furnace room of the earth, can cause both destruction and also be a giver of great life. It has put on another display of its power and glory within the last few weeks with the awakening of one of its most spectacular masterpieces of sustainable natural development, Mayon Volcano. ​Mount Mayon, rises to a towering and breathtaking 2,500 metres directly from sea level. It is next to the city of Legazpi, Albay Province, Bicol Region, at the southern end of Luzon Island, which is the main Philippine island with over 60 million people. The word mayon means "beautiful" in the local Bicol dialect of the Philippines. It is a major tourist attraction for the Philippines. Local folklore refers to the volcano being named after the legendary princess-heroine Daragang Magayon (Beautiful Lady). Numerous festivals and rituals are associated with the volcano and its landscape. Mayon is the world's most perfect-shaped active volcano. It has a perfect symmetric cone shape because of lava flows and pyroclastic surges over many thousands of years. In addition to this, its lava sits near the top of the volcanic cone, even during its less volatile times. Every few years it will have a medium to large explosion, but not a cataclysmic explosion which would blow the perfect cone of the mountain apart. It's considered by many as one of the seven natural wonders of the Philippines, which has many natural wonders. It could even been considered as a strong candidate for one of the seven natural wonders of the world. Besides destruction, volcanoes spread nutrient rich lava onto the surrounding lands. When the rains come it distributes these nutrients to form deep rich fertile soil. The soil around Mayon volcano can support many millions of people. Viva Mayon! In regard to the recent volcanic explosions of Mount Mayon, the Philippine Institute of Volcanology and Seismology said recently that lava eruptions had been intense but sporadic. It measured ash plumes rising up to three miles high. Lava and boulders were propelled out of the volcano like cruise missiles, reaching heights of 2 miles. Luckily, there have been no reported direct fatalities from this latest explosion. The locals, particularly those farmers who live on or near the slopes, as well as the government are very aware and respectful of Mount Mayon, and know when to give it extra space by falling back behind an exclusion zone for safety. In the case of the latest eruption the exclusion zone has been set at 5 miles from the base. The institute also reports that continuous GPS measurements show that there has been sustained swelling and inflation under the volcano since October which is consistent with pressurisation by magmatic intrusion. This current eruption could carry on for up to a few months to relieve the built up pressure. Mayon Volcano sits on the famous Pacific Ring of Fire. The Pacific Ring of Fire is associated with a nearly continuous series of oceanic trenches, volcanic arcs, and volcanic belts and plate movements. It has 452 volcanoes (more than 75% of the world's active and dormant volcanoes. About 90% of the world's earthquakes and 81% of the world's largest earthquakes occur along the Ring of Fire. Mayon is located on a particularly notable part of the Pacific Ring of Fire nearby two of the world's deepest ocean trenches, which are the Marianas Trench closely followed in depth by the Philippine Trench as detailed in the map above. 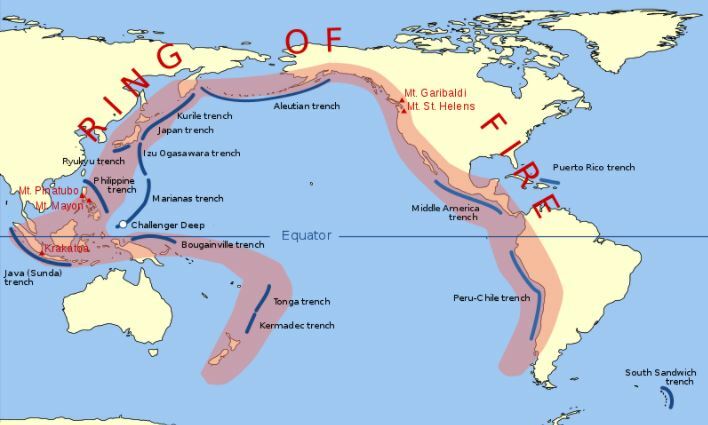 ​The Ring of Fire is a direct result of plate tectonics: the movement and collisions of lithospheric plates, which can be seen in the map below.